Link and Toon link (SO CUTE!!). 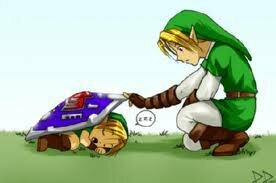 Lol i forgot how i found this pic.. so I just Gave credit to Google :x. Wallpaper and background images in the The Legend of Zelda club tagged: the legend of zelda link cute chibi anime. This The Legend of Zelda photo might contain anime, comic book, manga, and cartoon. Older Link: GIVE ME BACK MY SHIELD!!! Aww! This picture is nice (Couldn't think of a better word XD. Curse you, vocabulary!). Looks like Link found Kowalski's chronotron (Spelling? ).